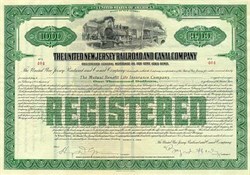 Beautifully engraved Stock Certificate from the United New Jersey Railroad and Canal Company issued in 1924. This historic certificate was issued during the Roaring 20's and is over 81 years old. This certificates has a green ornate border around it with a vignette of an old train pulling into the trainstation. The cancelled certificate has a hand signature of the company's officers. It is printed with the company's corporate seal embossed at the bottom left.